Pioneered in the early 1990s, and named after a much-mourned bull elephant, Abu Camp has been running for 20 years, and as such is the original elephant safari experience in Africa. 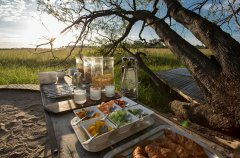 Abu Camp, while never forgetting its environmental footprint, aims to provide the very best in privacy, location, accommodation and service. Allowing all who visit to absorb themselves in a whole new world, the camp is a haven of peace and tranquillity, immersed within the natural rhythms of the bush. No minimum or maximum number of nights are required although for a full experience, a minimum stay of 3 nights is recommended. 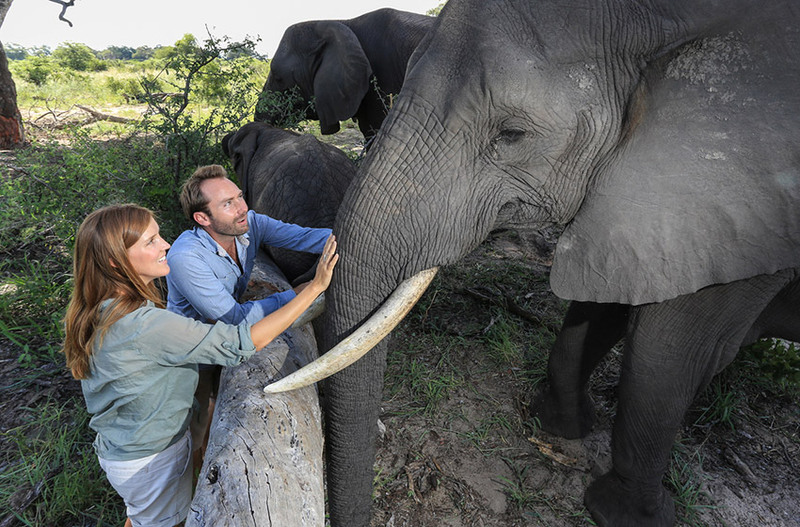 Elephant activities are offered daily. Abu Camp does not have a family room. Children between the ages of 6 and 16 years can be accommodated as a triple share in a standard twin room on an extra bed (maximum 2 extra beds available for this purpose at any one time). This may impact on space and comfort. 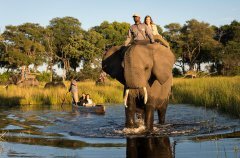 elephants) and solo elephant rides. 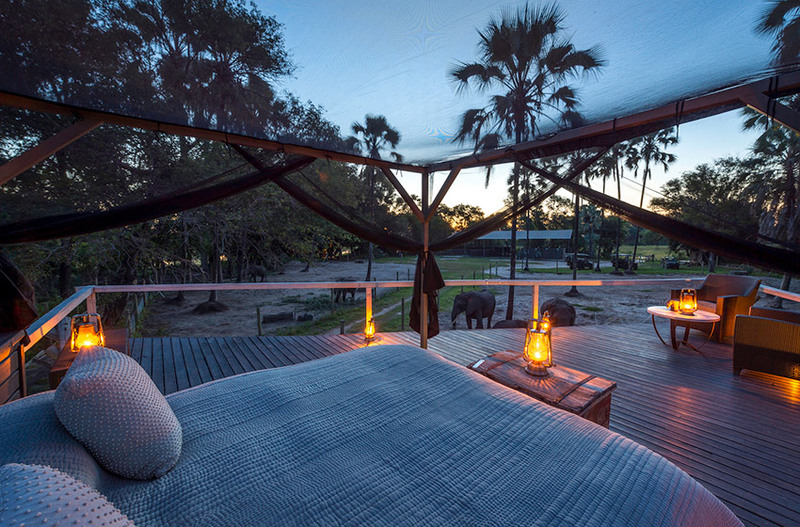 Children between the ages of 6 and 16 years may participate in a sleep out on the outdoor star-deck as well as on an elephant ride, provided they are accompanied by an adult, on the star-deck or on the same elephant respectively. 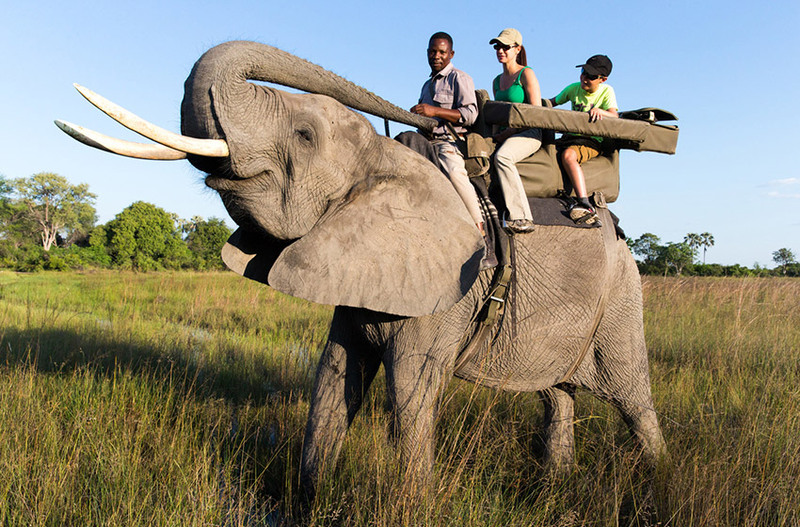 with children between 6 and 16 years are accommodated sole use on game drive and boating activities. 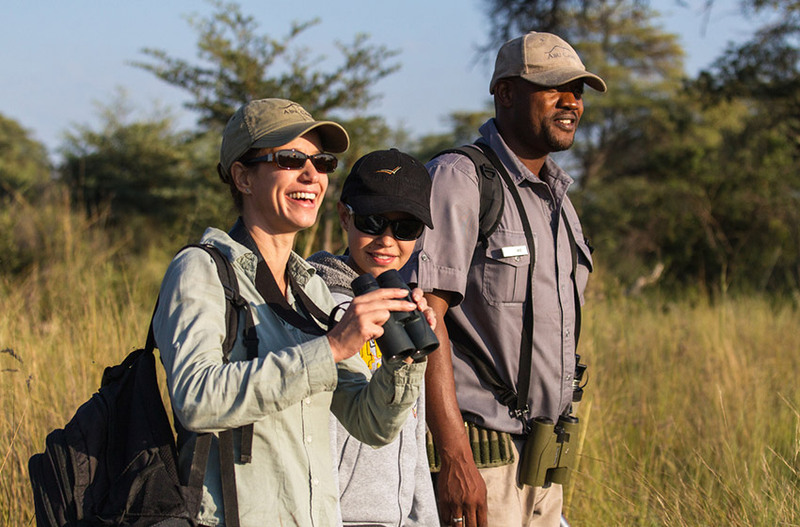 When booking sole use of Abu Camp the minimum camp age restriction falls away, however activity minimum requirements remain in place for safety reasons. 1. At Abu Camp the minimum age requirement for walking with elephants and solo elephant rides is 13 years. 2. 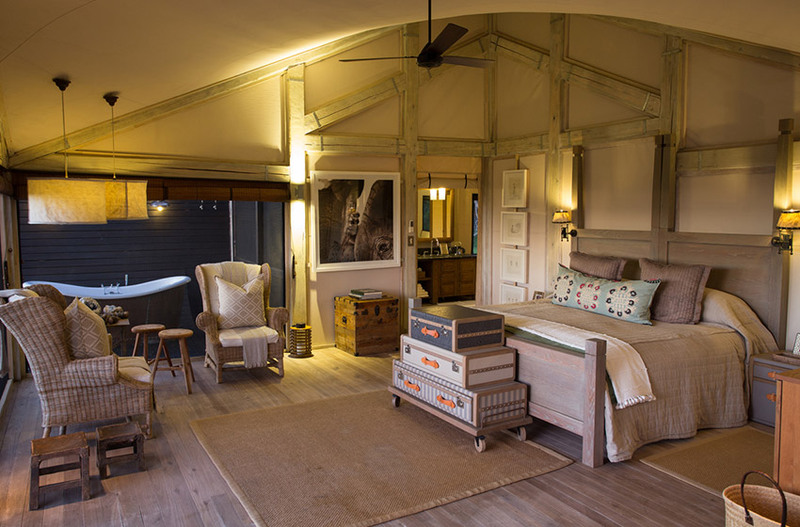 Children between the ages of 6 and 12 years staying at Abu Camp may participate in a sleep out on the outdoor star-deck as well as on an elephant ride, provided they are accompanied by an adult, on the star-deck or on the same elephant respectively. 3. 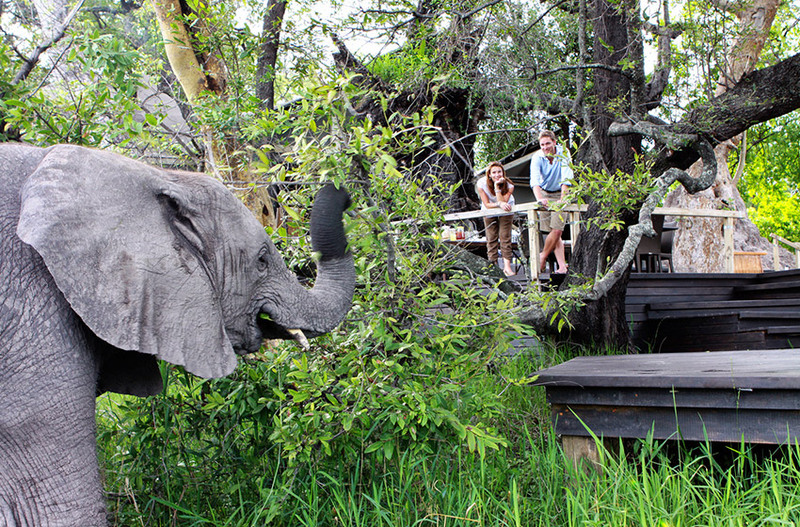 Parties with children between 6 and 12 years will share in elephant activities at Abu at the same time. 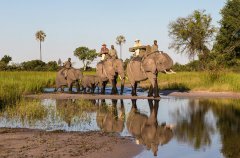 Where possible the camp will allocate and roster other activities in such a way that these parties are accommodated sole use on game drive and boating activities, providing private activities have been booked. 3. 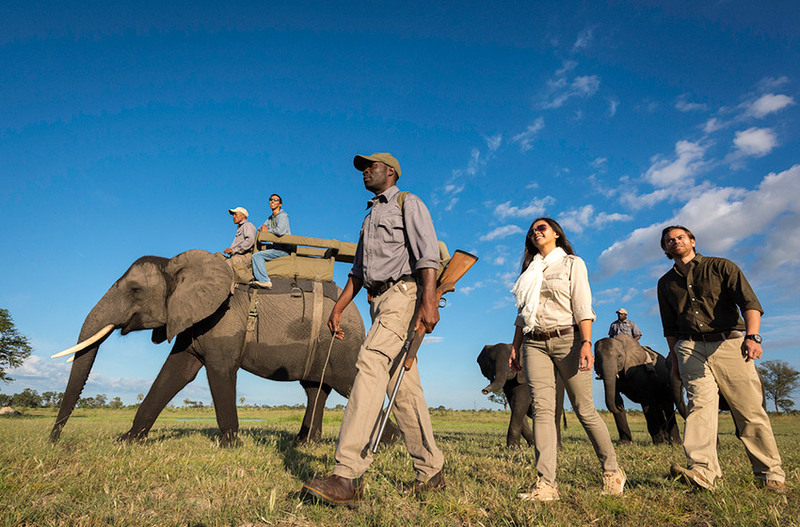 Elephant excursions at Abu Camp cannot be booked on a private basis. 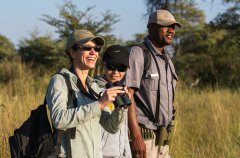 Off-peak Season - 11 January to 31 May and 01 November to 19 December, 65% discount extended with the exception of Kalahari Plains where this is peak season and 35% discount applies. 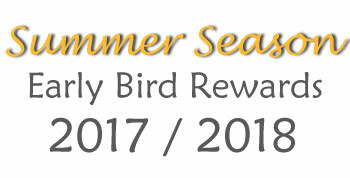 Peak Season - 01 June to 31 October and 20 December to 10 January, 35% discount extended with the exception of Kalahari Plains where this is off-peak season and 65% discount applies. The discounted child rate is only applicable to bookings in family rooms or standard twin rooms in camps that have a family room (should the family room not be available for your particular booking). 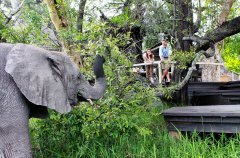 Child rates do not apply at those camps that do not have family rooms, with the exception of Abu where the child rate may be extended to a triple booking. Children under the age of 17 years are required to share accommodation with at least one adult at all times. Child rates apply only when children aged 16 years or under are sharing with full paying adult/s and must be calculated accordingly i.e. 2 adults and 2 children in a family, charge 2 x adult sharing rate plus 2 x the applicable child rate. 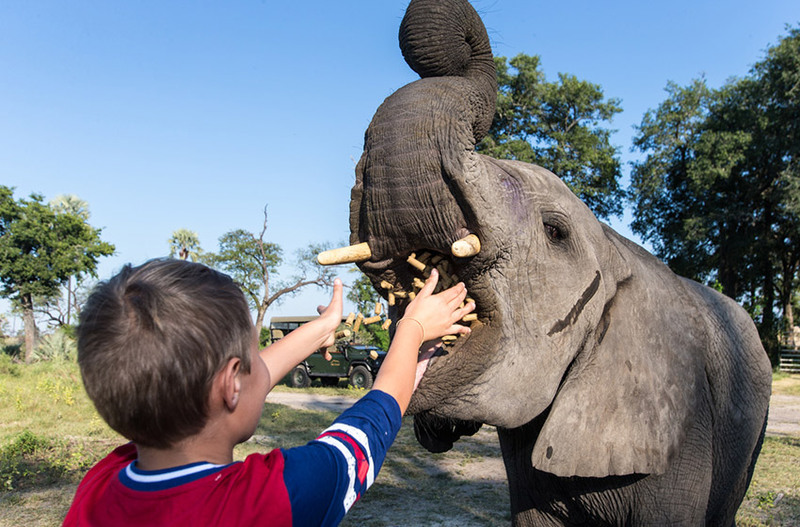 In addition, at our Classic and Premier camps, parties with children 12 years and younger are required to book and pay for private activities unless the camp is booked as exclusive use or they have filled a vehicle (6 guests). 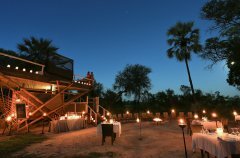 A family booking will depend on availability of the private vehicle/activities at the selected camp for the period requested. Child participation in activities will vary depending on the camp and the activity. Triple share accommodation is on a request basis and only allowed for children 16 years and under sharing with adults - not for three adults sharing. Guests must accept that there is usually an impact on space and comfort in the case of triple share accommodation. Please contact your Journey Specialist for assistance and pricing. At Abu Camp the minimum age requirement for walking with elephants and solo elephant rides is 13 years. 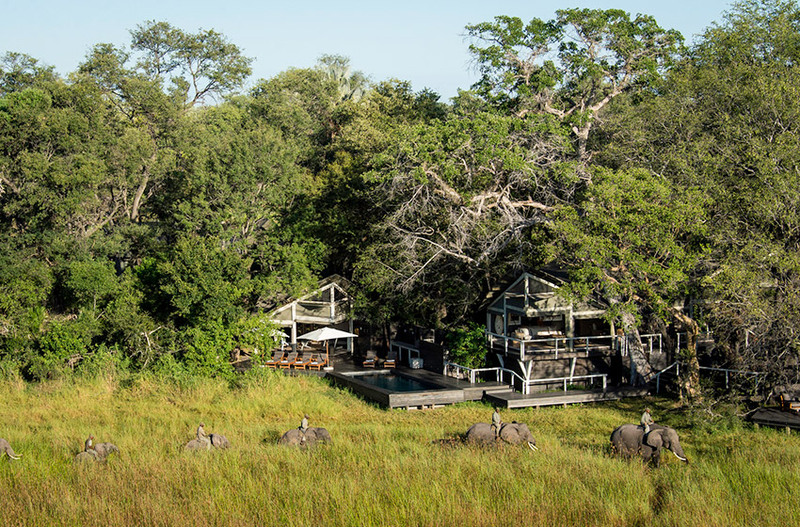 Children between the ages of 6 and 12 years staying at Abu Camp may participate in a sleep out on the outdoor star-deck as well as on an elephant ride, provided they are accompanied by an adult, on the star-deck or on the same elephant respectively. 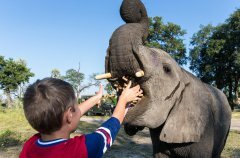 Parties with children between 6 and 12 years will share in elephant activities at Abu at the same time. 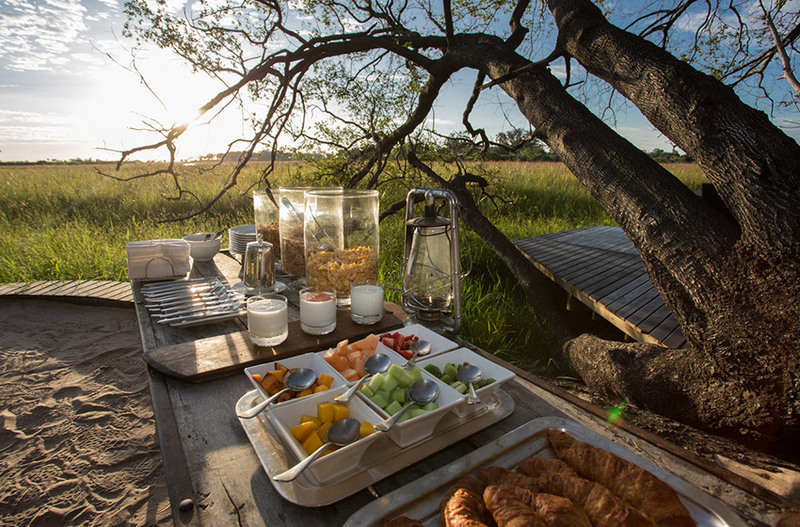 Where possible the camp will allocate and roster other activities in such a way that these parties are accommodated sole use on game drive and boating activities, providing private activities have been booked. 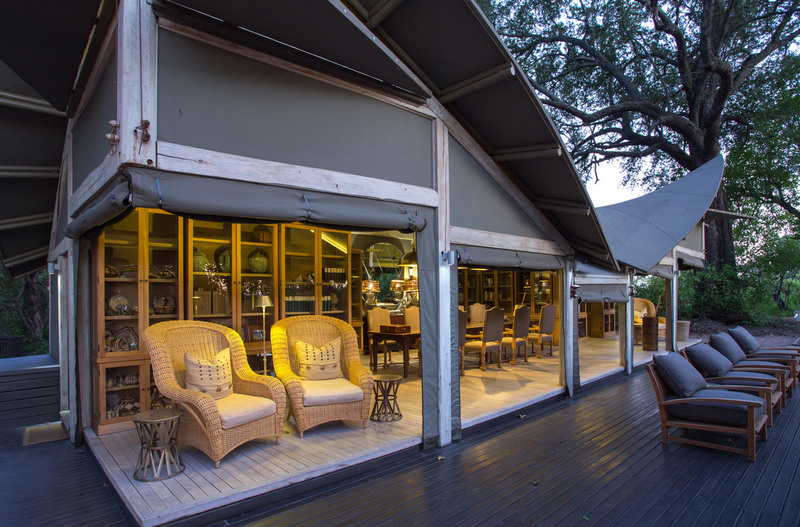 Internationally trained chefs provide creative cuisine of the highest standard, and meals – most of which are served al fresco on the deck – are superbly complemented by wine from our extensive cellar. A wide choice of international spirits and single malt whiskies are on offer. Long safari days end with a nightcap around the campfire, recounting the day’s adventures. 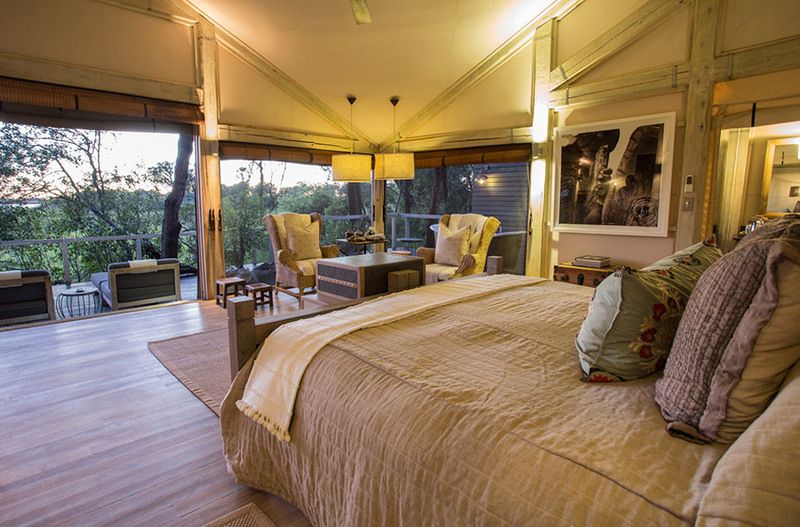 For those seeking the ultimate immersion experience into the serene, sensory world of the African elephant, Abu Camp now offers the opportunity to sleep out under the stars, in our new Star Bed overlooking the elephant boma. 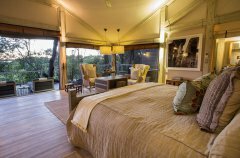 On request, guests are escorted to the large double bed of the Star Bed after dinner on one night of their stay at Abu Camp. 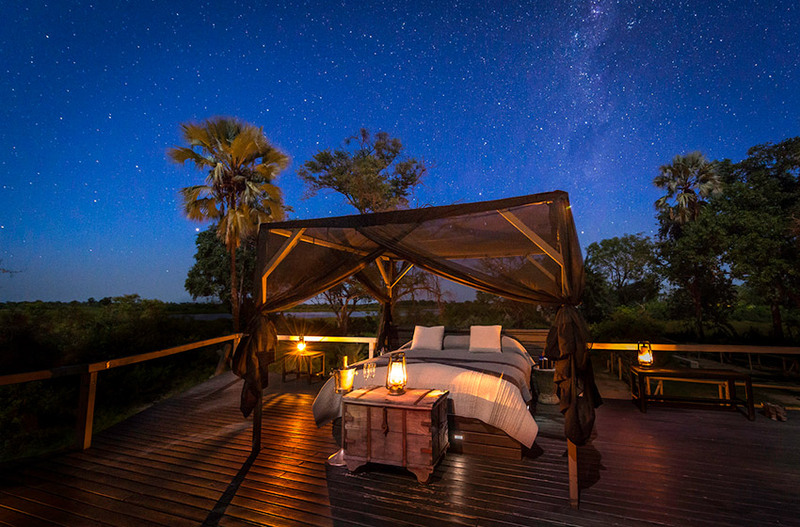 Here, raised high above the ground, they sleep beneath the incredible canopy of stars so iconic of the southern hemisphere, and are lulled to sleep by the contented rumbling and low snores of the elephants below. 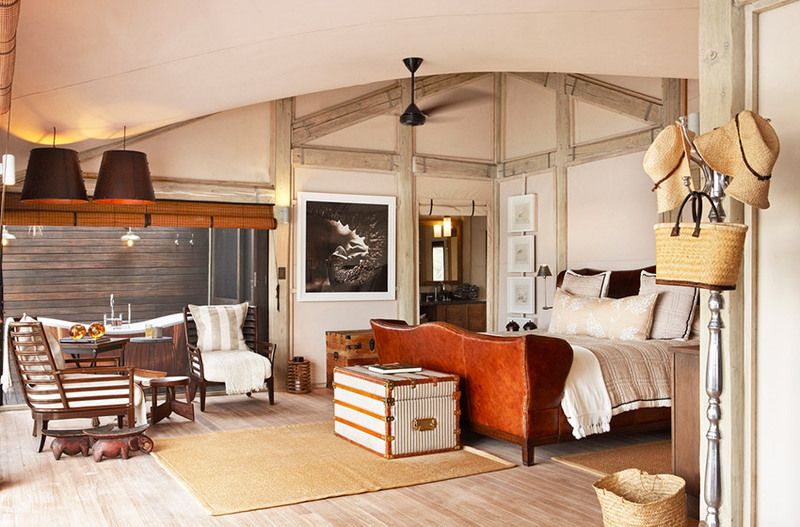 The Star Bed offers an opportunity to “sleep with the elephants” found nowhere else in Africa. To ensure complete comfort a bathroom, including an open shower, is found on the tier below the top deck. Flowing beautifully from tiered decking, an imaginative use of canvas and poles forms the main area of camp. 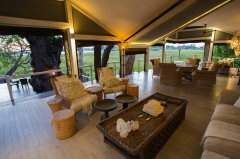 Creating a modern, unique blend of sweeping lines in complete harmony with the surrounding wilderness, the lounge and dining room have been designed to complement the easy flow of nature and to accentuate a feeling of lightness during your stay at Abu Camp. 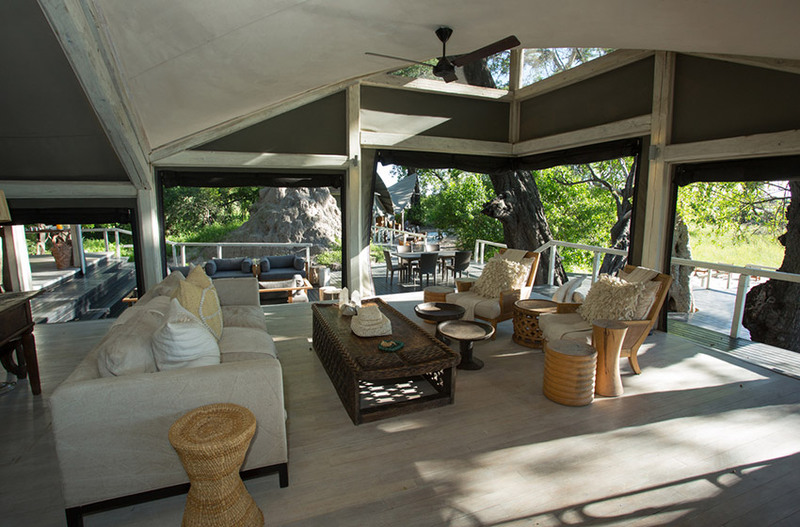 Borrowing from the local African cultures, homeware, hand-woven linen fabrics, ceramic light pods, woven seagrass chairs and hand-hewn wooden pieces give the camp the elegant flair of the Okavango Delta. The library, a well-stocked collection of African literature and field guides, is the perfect setting for reading and quiet reflection. Leading off from the library is a communication area for those guests wishing to stay in contact with the outside world. A stylish, secluded swimming pool completes the amenities. Meet and interact with our elephant herd, from wise matriarch Cathy to the energetic youngster, Naledi. 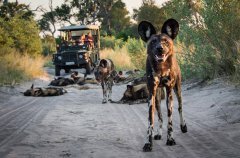 Take a unique nature walk by following the herd on foot as they move through the bush, feeding as they go. Sleep under the stars in our Star Bed near the elephant boma; be lulled to sleep by elephant rumblings from the nearby resting herd. 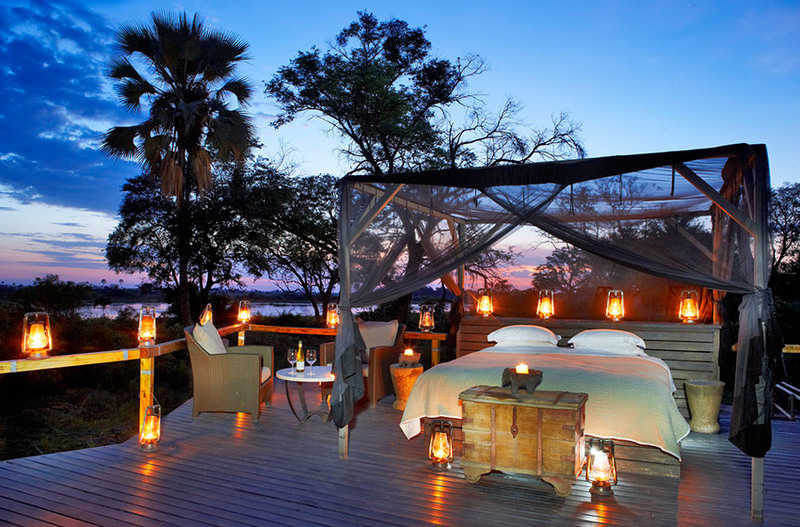 Soak in decadent bubbles in your outdoor copper bath under a starry African sky. 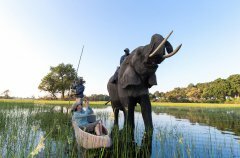 Explore the surrounding bush from a unique vantage point – on the back of a majestic, gentle elephant. Encounter the amazing variety of wildlife that lives in the Abu Concession on a game drive. 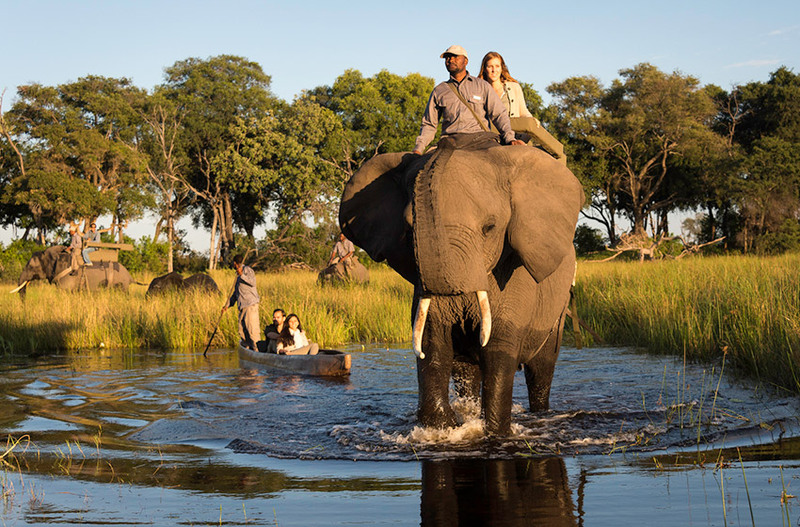 Prepare to be wowed by the 380 different species of birds of the Okavango region. 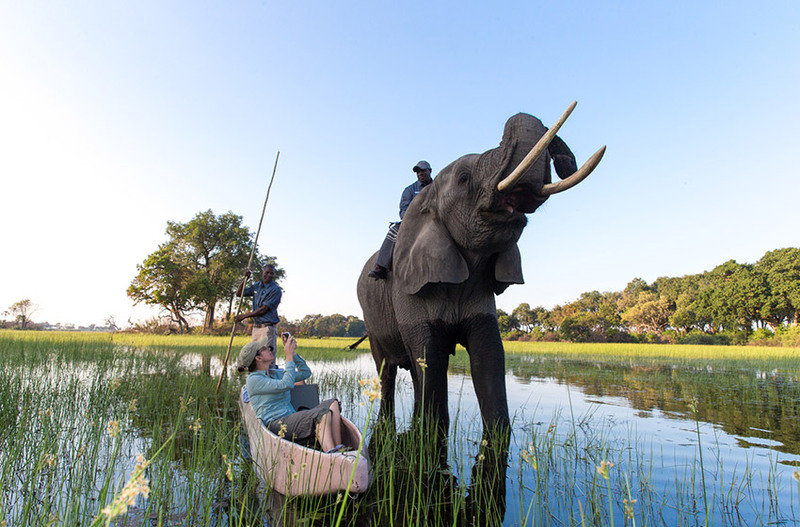 Glide along the silent waters of the Okavango channels by mokoro – dug-out canoe – or boat. 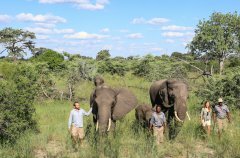 When the researchers are in camp, learn about the complex social structure of the herd and the challenges of elephant conservation.